The museum of Iznik is noted for its collection of Blue Tiles for which the city is famous. In 2014 I found many of the museums in Turkey, or certain exhibits, closed for remodeling. Even with a polite request we were not allowed to visit the various monuments displayed in the yard of the museum. 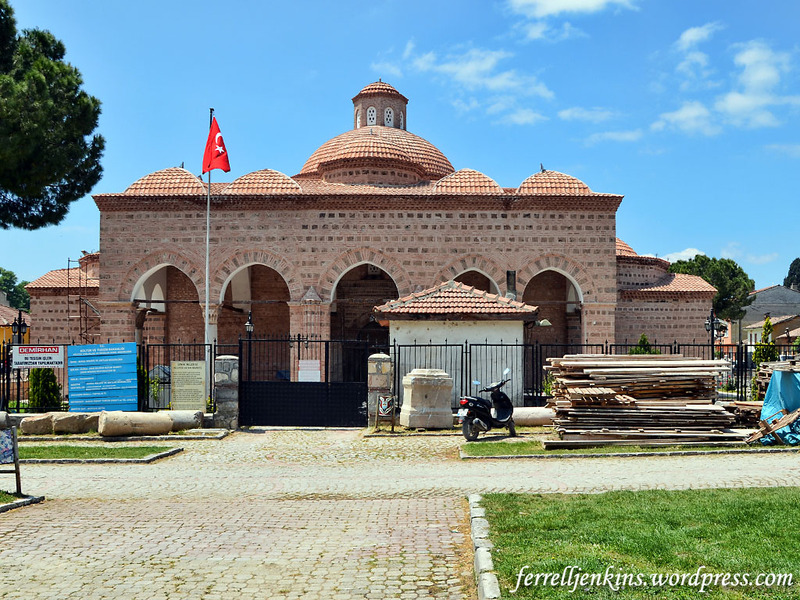 The museum of Iznik was closed for remodeling in 2014. Photo by Ferrell Jenkins. Missing the tile work for which the city is famous was not a great loss. Tile work from Iznik may be seen in the ceiling of the Blue Mosque, in the Topkapi Palace, and other buildings in Istanbul. 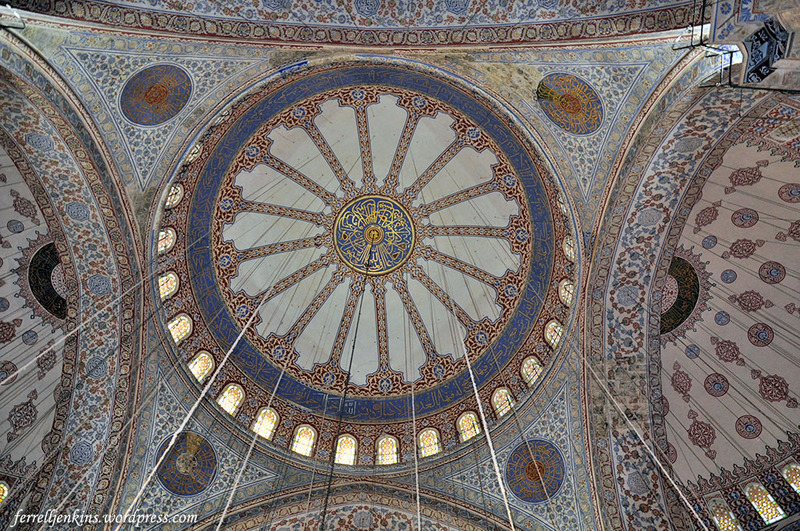 The ceiling of the Blue Mosque is a good example of the Iznik tile. Photo by F. Jenkins. One expects to see mosques in any Turkish city. 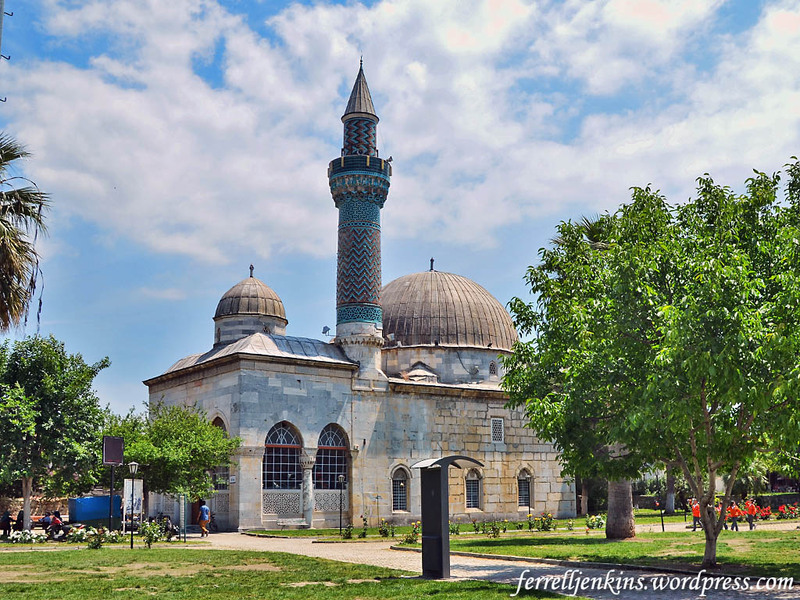 I am including this photo of the Yeşil (Green) Mosque. The promotional tourism information includes this information about the mosque. undoubtedly the most magnificent of the single domed mosques of the Ottoman Period. Its unique minaret is on the right corner of the mosque. While its niche displays rich stone work, its body is covered with blue and green coloured tiles in zigzag mosaic style. The Green Mosque in Iznik. Photo by Ferrell Jenkins. The events we have described in this series on Iznik/Nicea are post apostolic, but the general area does have two connections to the New Testament. On the outbound portion of Paul’s third journey he attempted to go into Bithynia, but was not permitted to do so. We have already pointed out that the epistles of Peter were written to saints in various Roman provinces including Bithynia. I plan to show you one more famous landmark on the outskirts of Iznik as the eighth in this series. This entry was posted in Bible Places, Bible Study, Book of Acts, Church History, New Testament, Photography, Travel, Turkey and tagged Apostle Paul, Apostle Peter. Bookmark the permalink.